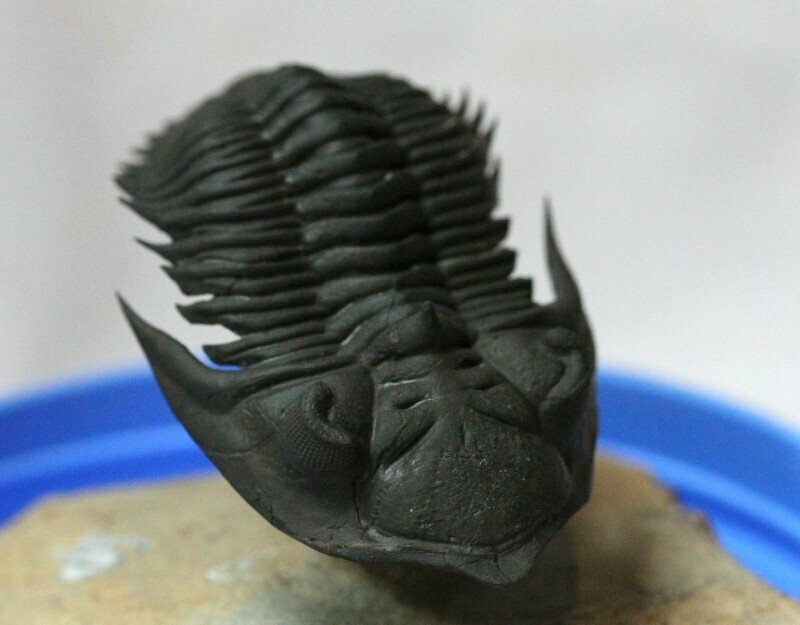 Description: This member of the trilobite Order Phacopida, Subfamily Asteropyginae is nothing short of an exquisite fossil specimen. It’s not the species rarity, because Metacanthina issoumourensis is fairly common. It’s not its life pose that, while time consuming and expensive, has become pretty common also. What makes it exquisite is the very fine preservation, and the also very fine and careful preparation. Metacanthina issoumourensis was previously called Asteropyge or Kayserops, and you will see those names still used. The Phacopids appear in the fossil record in the lower Ordovician. 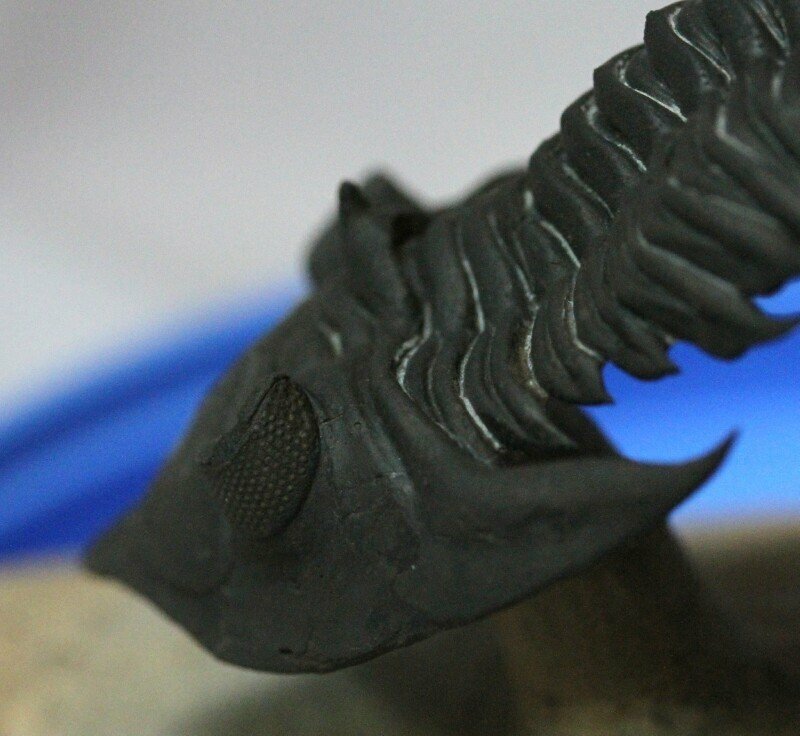 Phacopids of Suborder Phacopina, as seen here, are the only trilobites to have evolved the amazing schizochroal eyes that are superbly preserved in this specimen. 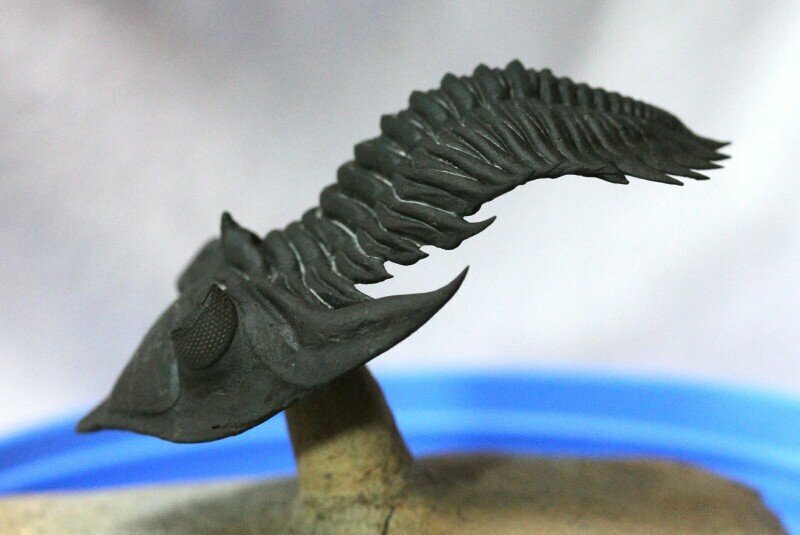 Most other trilobites, and most extant arthropods sport Holochroal eyes that have many more lenses (20 fold or so) packed hexagonally underneath a single cornea. The schizochroal eye was unique in that each lens is biconvex and was made of two calcite elements having different refractive indices. These were separated by an aspherical surface giving an overall effect of correcting spherical aberration. 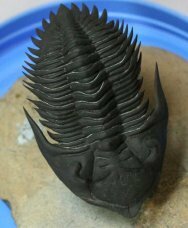 Ostensibly, whether predator or prey, it could see them better, a huge advantage in the trilobite arms race. The development of the schizochroal eyes is but one example in nature of so called post-displacement paedomorphosis, whereby selective pressures, because survival is benefited, results in the retaining of traits previously only existing in juvenile members of a species. The Phacopina thus constitute a notable example that Life remembers its history, with that memory embedded in the genomes. This evolutionary innovation has never been repeated among the Arthropods.